Looking to put some some fender flares on that new or used truck? True Edge has your back! Our True Edge fender flares can come in a smooth, textured, or painted to color match finish. Best of all, we give free ground shipping on ALL of our flares in the lower 48 states! We have options for the Ram, F-150, F-250/350, Silverado, Sierra, Tundra, Titan, and more! Check out the options we have on our website, or ask your account manager for details and prices on the True Edge flares. Restylers' Choice now has vehicle specific graphic kits available for the 2015+ Ford Edge! 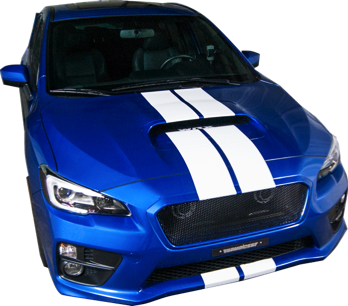 Featuring a variety of both side graphics and hood graphics, you'll find the one that's right for your customer! As always, all of our vehicle graphic kits can be made with either Universal Products' 2 mil high performance vinyl, or in the Avery Supreme Wrap vinyl. You can check out all of the designs we have available for the Edge and more at www.graphicscatalog.com! Restylers' Choice and Xpel are proud to announce our newest program, the Custom Auto Designs Access Program! If you have a vinyl plotter, you can download our vehicle specific graphic kit designs and cut them out with your own material. You can view all of the graphic kits that are available on www.graphicscatalog.com. Call us today for more details and pricing about this exciting new program! Are you ready for your chrome life to become Simple? Restylers' Choice is proud to announce Simple Chrome, our new line of chrome accessories! This new product line contains the most popular applications for door handles, tailgate covers, and mirror covers. 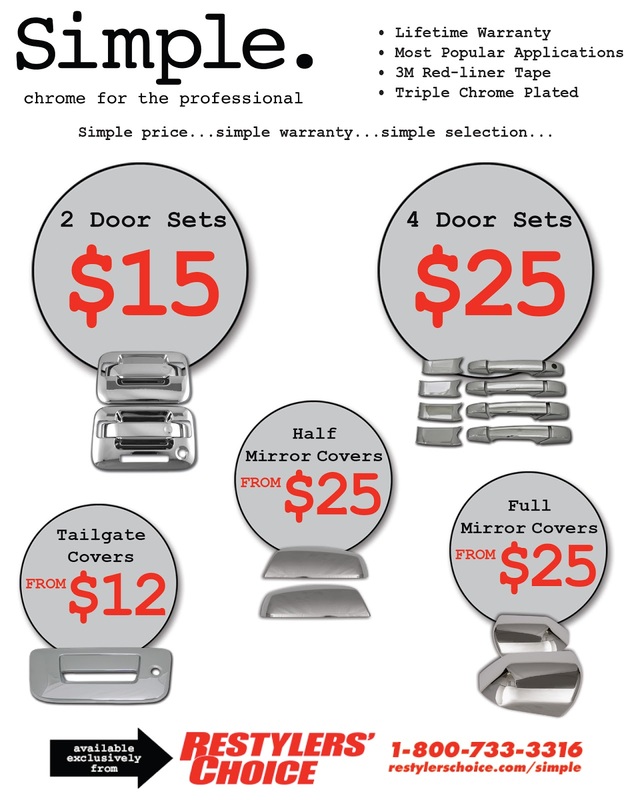 The Simple Chrome products come with a lifetime warranty, made with 3M Red-Liner tape, and are triple chrome plated! Simple prices, simple warranty, simple selection! The Simple Chrome will be arriving shortly in our warehouse, so give us a call today to pre-order some of these new chrome products, and to also request a list of the applications available! The 2015+ Dodge Charger Hellcat OE spoiler is our most popular wing that we have to offer! It's a great accessory to give the Charger an aggressive new look. Order our painted spoilers in multiples of two, and we'll give you free ground shipping on them! 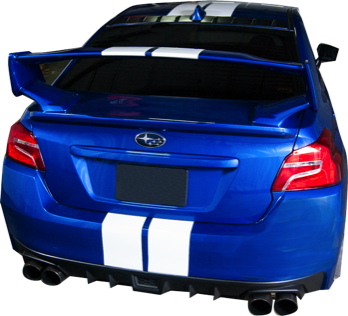 Please give us a call for pricing on this spoiler and all of our other popular wings! We've recently improved our vehicle specific graphic website, www.graphicscatalog.com, with a brand new look! Now it's easier than ever to navigate our wide selection of graphics. Also with this new version of the website, it's now mobile friendly and tablet friendly! So you can now easily show your customers on your phone or tablet device our vehicle graphics! Check it out and let us know what you think! August has arrived! Why not show off your favorite summertime activity with a Window Canvas graphic! Football, fishing, soccer, golf, and much more! Check them out!